Petrolheads like me might be excited upon first learning of this game, thinking that it is somehow tied in to the UK TV Show. This is of course not the case as this game came out long before that show started. Top Gear is easily one of the best racing games on the Super Nintendo. You have 4 cars to choose from, all of which look like Ferraris or Lamborghinis, and all of which have slightly different characteristics including maximum speed, “0 to 100” time, tire grip, and fuel consumption rate. As with most racing games, you can also choose between manual and automatic transmissions. At the beginning of each race, you are given a small number of nitrous oxide boosts than you can use to push yourself past stubborn opponents. The game features a whopping 32 unique tracks, grouped in fours over 8 geographical areas. After each area is completed, you are given a password so that you can continue from that point rather than starting the game over each time you play. Reminiscent of Final Lap Twin on the TurboGrafx-16, Top Gear is always played in split screen mode. 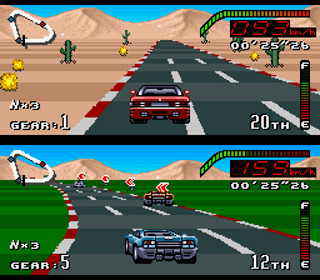 During single-player mode, the lower half of the screen shows one of the computer-controlled cars. This is one of the few aspects of the game that I don’t care for, as I would prefer to play single-player in full screen mode. Unless you’re playing with someone, the lower half of the screen is basically useless. The car models are nothing to write home about but the backgrounds are detailed and specific to each locale, and the striations on the road along with the dotted lane lines and the red and white strips on the side of the road really impart a sense of speed as they whiz by. The real star of the game though is the soundtrack. Scored by a lesser-known composer named Hiroyuki Masuno, who also wrote music for subsequent editions of Top Gear along with lesser-known SNES titles like Drakkhen and Phalanx, the game’s music is part techno, part rock, and part 80’s new age jazz. The tracks played during the intro, title, and menu screens and the first race are two of the best chiptune tracks that I’ve ever heard. As this game is neither first-party nor hard to find, it is a $5 or less cartridge and as such is a no-brainer for any SNES owner. Buy Top Gear on GameGavel or Amazon. Tagged Kemco, Racing, Review, SNES, Super Nintendo, Top Gear. Bookmark the permalink.